1516 Part of the Ottoman Empire. 172. - 1806 Baku Khanate (see below), under Persian rule. 10 Jul 1723 - 10 Mar 1735 Baku occupied by Russia (annexed 12 Sep 1723). (Shamakha) (25 Dec 1805) annexed by Russia. 6 Oct 1806 Baku annexed by Russia. Russia by the Treaty of Gulistan. Azerbaijan, and Georgia [see under Georgia]). 14 Dec 1846 Shemakha guberniya. 18 Dec 1859 Baku guberniya. 17 Jul 1918 - 15 Sep 1918 Baku occupied by Allied (British) forces. 15 Sep 1918 - 18 Oct 1918 Baku occupied by the Ottoman Empire. 17 Nov 1918 - 19 Aug 1919 Baku occupied by Allied (British) forces. 27/28 Apr 1920 Soviet Russian forces occupy Baku. Soviet Republic (see under Georgia). Socialist Republic becomes full union republic. 23 Sep 1989 State sovereignty declared. 30 Aug 1991 Independence declared. 26 Dec 1991 Independence effective (dissolution of U.S.S.R.). Azerbaijan (recognized only by Armenia). 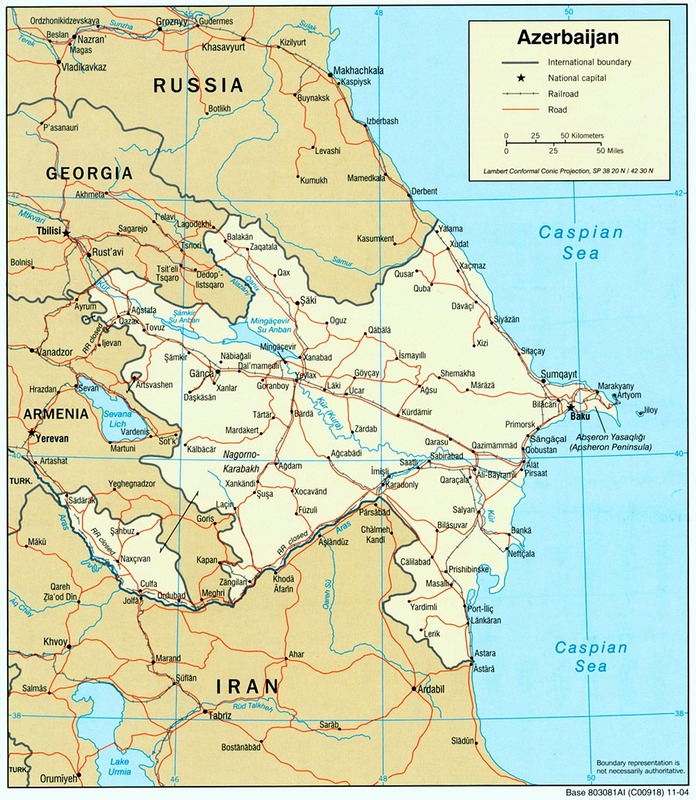 Territorial Disputes: Azerbaijan, Kazakhstan, and Russia ratified the Caspian seabed delimitation treaties based on equidistance, while Iran continues to insist on a one-fifth slice of the sea; the dispute over the break-away Nagorno-Karabakh region and the Armenian military occupation of surrounding lands in Azerbaijan remains the primary focus of regional instability; residents have evacuated the former Soviet-era small ethnic enclaves in Armenia and Azerbaijan; local border forces struggle to control the illegal transit of goods and people across the porous, undemarcated Armenian, Azerbaijani, and Georgian borders; bilateral talks continue with Turkmenistan on dividing the seabed and contested oilfields in the middle of the Caspian. 2 Nov 1917 - 31 Jul 1918 Baku Soviet Commune established. Republic of Transcaucasia (see under Georgia). troops and in opposition to Azeri national government at Ganja. 17 Jul 1918 - 15 Sep 1918 Baku occupied by British forces. 15 Sep 1918 - 18 Oct 1918 Baku occupied by Ottoman forces. 5 Dec 1936 Renamed Azerbaijan (Azerbaidzhan) Soviet Socialist Republic. 3 Apr 1952 - 23 Apr 1953 Baku oblast (within Azerbaijan S.S.R). 3 Apr 1952 - 23 Apr 1953 Ganja oblast (within Azerbaijan S.S.R). 30 May 1930 Kurdish District (Kurdinstanskiy okrug). 23 Jul 1930 Dissolved by Soviet Union, population resettled. c.1554 State under the rule of an Atabeg founded; part of Persia. 1588 Part of the Ottoman Empire. 1606 Khanate of Qarabagh (Karabakh) founded. 14 May 1806 Annexed to Russia by Treaty of Kurekchay. Oct 1822 Khanate abolished by Russia. 1918 renamed Karabakh Armenian National Council). Sep 1918 - 31 Oct 1918 Ottoman occupation. the borders of Azerbaijan, but continues separate government. Apr 1920 Karabakh declared incorporated into Armenia. Nagorno-Karabakh and Zangezur as part of Armenian S.S.R. which was declared as "autonomous within Republic of Armenia." 2 Apr 1921 Republic of Syunik proclaims independence. 1 Jul 1921 Mountainous Armenia renames itself the Republic of Armenia. 5/9 Jul 1921 Soviet Russian occupation. 5 Dec 1936 Renamed Nagorno-Karabakh Autonomous Oblast. but recognized by Armenian S.S.R. on 15 Jun 1988). ratified by Armenian S.S.R. 1 Dec 1989). 12 Jan 1989 - 28 Nov 1989 Under direct administration by the Soviet Union. 28 Nov 1989 Autonomy abrogated by the Soviet Union. of Nagorno-Karabakh and Armenian S.S.R. 27 Aug 1990 Azerbaijan S.S.R. abolishes Nagorno-Karabakh autonomy. 26 Nov 1991 Azerbaijan abolishes Nagorno-Karabakh Autonomous Oblast. 6 Jan 1992 Independence declared (not internationally recognized). - Feb 1994 and Zangelan from 1 Nov 1993. 12 May 1994 - Cease-fire by Armenia, Azerbaijan and Nagorno-Karabakh. 10 Mar 2017 Renamed Republic of Artsakh (Republic of Nagorno-Karabakh). 1635 - 1636 Ottoman occupation. 1722 - 1736 Ottoman occupation. 1747 Khanate of Nakhchivan (Nakhchevān). 22 Feb 1828 Annexed to Russia by the Treaty of Turkmenchay. 1834 Khanate abolished by Russia. uyezds of Nakhchivan, Sharur-Daralagez and Surmal. 26 Jan 1919 - 6 Jun 1919 Allied (British) occupation of Nakhichevan. 6 Jun 1919 - 10 Aug 1919 Occupied by Armenia. Mar 1920 - 1920 Occupied by Turkey. Republic of Nakhichevan is proclaimed. 19 Jun 1923 Part of Azerbaijan S.S.R. 5 Dec 1936 Renamed Nakhichevan Autonomous Soviet Socialist Republic. 20 Jan 1990 Independence declared from Soviet Union, but not Azerbaijan. (confirmed by Azerbaijan 12 Nov 1995). 1785 - 1789 Subordinated to the Quba Khanate. 12 Oct 1813 Annexed to Russia. Apr 1918 With aid of Baku Commune, Soviet rule established at Lenkoran. proclamation of independence of Azerbaijan. 28 Dec 1918 Re-organized as Mughan Territorial Administration. 25 Apr 1919 Mughan Soviet Republic proclaimed within Russian S.F.S.R. Peasants' Deputies of Lenkoran district. 23 Jun 1919 Integrated into the Azerbaidzhan Soviet Socialist Republic. around Lankoran in rebellion (not recognized by Azerbaijan). 10 Jul 1723 - 10 Mar 1735 Occupied by Russia (annexed 12 Sep 1723). 1735 - 1747 Annexed to Persia. Jul 1796 - Mar 1797 Occupied by Russia. 6 Oct 1806 Annexed to Russia. 3 Jan 1804 Annexed to Russia. 1729 Khanate founded, under Persian suzerainty. c.1583 Annexed to Ottoman Empire. 1761 - 1765 Part of Qazi Qumuq (Daghestan). 21 May 1805 Annexed to Russia. 1721 - 1732 Part of Russia. 1732 - 1747 Part of Persia. 1748 Khoja Shamakha and Yeni Shamakha khanates founded. 1786 Merged into (re-united) Shamakha. 25 Dec 1805 Annexed to Russia.